Originally from Calgary, Alberta, Canada, Jillian has lived in Iowa since 2005. She holds degrees from the Universities of Oregon, Northern Colorado, and Calgary. She has performed internationally with the National Youth Orchestra of Canada, as well as various chamber groups. She has recently recorded two CDs with her saxophonist husband, Dave Camwell (Timescape), and their chamber group, Sonoroso (Sonoroso). 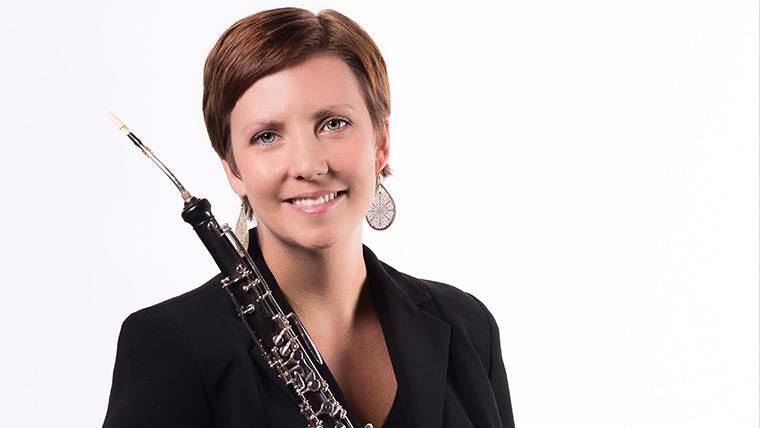 Jillian has held the position of English horn and third oboe with Orchestra Iowa since 2005 and maintains an active teaching studio. They live in Indianola with their two young sons and musical cat, Clara Schumann. The grand re-opening Gala concert with Harry Connick Jr. was a really fun time. The best part was when Harry had me stand up in the concert and acknowledged me in front of the sold-out crowd. I started playing the oboe in 8th grade after one year on the clarinet. I’d played the piano since age 7. My junior high band teacher had asked if I wanted to switch to the oboe, and I said, “What’s an oboe?” Thanks, Mr. Mac! My first experience with the English horn didn’t come until high school, when I played in the Calgary Youth Orchestra. I was thrown into the English horn world on Debussy’s L’Après-Mini d’une faune, which is a tricky piece for us! My former teachers have all been greatly influential. I listen to all styles of music—Baroque, Classical, Romantic, Neo-Classical, Neo-Romantic… Oboists Peter Cooper, Nicholas Daniel, Francois Leleux and Albrecht Mayer are among my favorite players. I wanted to be a children book’s author when I was little. Or a bus driver. But I think the bus driving days have sailed. I love to teach piano and oboe, and I have also become interested in midwifery, believe it or not! I still may pursue a second career as a doula in the next five years. I also have my own business as a Pampered Chef Consultant, and I teach people to cook. My mother would not have believed you if you’d told her that when I was in high school.